Giuseppe Tartini was born in Pirano near Trieste (now Piran in Yugoslavia) on 8 April 1692. What little is known about his early life derives from a biography written by his friend, the cellist Antonio Vandini. It seems that his family intended him for the priesthood, and in 1708 he travelled to Padua to study law at the university. Instead, he married and turned to music, which brought him into conflict with the Church authorities and caused him to seek refuge in Assisi, where he is said to have studied with the Czech composer Bohuslav Cvernohorský. Tartini lived a nomadic life working as a violinist in northern Italian towns until 1721, when he was appointed leader of the orchestra at St Anthony’s Basilica in Padua. The terms of his employment still left him free to travel, and he spent several years in Prague, attracted there by the coronation of Charles VI in 1723. Soon after his return to Padua he founded his famous violin school, which attracted pupils from all over Europe and caused him to write a number of treatises, including a work on ornamentation that was plundered by Leopold Mozart for his Violinschule. Tartini’s later career was largely taken up with the study of musical theory and acoustics, and he published several theoretical works in the 1750s and ’60s. They are a strange mixture of archaic theory, faulty mathematics and practical observation, and they were much criticized at the time by progressive writers; his sensitive and retiring soul found this hard to bear, and his last years were clouded by controversy. He died in Padua on 26 February 1770. Tartini was a prolific composer for his instrument. There are more than 130 authenticated violin concertos by him, over fifty of which survive in his autograph, and about the same number of solo violin sonatas, as well as about forty trio sonatas. Many of them were published north of the Alps by Michel Charles Le Cene in Amsterdam, by John Walsh in London, and by Charles-Nicolas Le Clerc in Paris. Italian composers tended to publish abroad because the music publishing industry in their native land was in terminal decline—most music circulated there in manuscript—and because the market for instrumental music was most highly developed in the wealthy cities of northern Europe. The music on the first disc comes, with one exception, from Sonate a violino e violoncello o cimbalo Opus 1 (Amsterdam, 1732), reprinted as XII Solos for a Violin with a Thorough Bass for the Harpsicord or Violoncello (London, 1746). Tartini’s publications are a minefield for the unwary bibliographer. There are no fewer than five collections with the label Opus 1, and it is not clear how authoritative the northern European editions are; it is difficult to believe, for instance, that the XII Sonatas for two violins and bass (London, 1750) were really ‘Printed at the Author’s Expence’, as the title page claims. 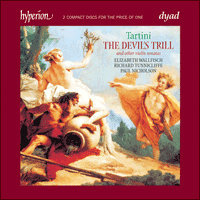 The only work of Tartini that was generally known in the nineteenth century, the ‘Devil’s Trill’ Sonata, was not published complete in his lifetime, and eventually appeared in J B Cartier’s treatise L’art du violon (Paris, 1798). Cartier stated that it was ‘very rare’, and that he had acquired it from Pierre Baillot, who studied in Rome with a pupil of Tartini’s favourite pupil, Pietro Nardini. Like most composers who lived through the central decades of the eighteenth century, Tartini’s style changed markedly during his career. Charles Burney, who arrived in Padua just after the composer’s death and met a number of his friends and colleagues, wrote that ‘he changed his style in 1744, from extreme difficult, to graceful and expressive’. It is not clear what event precipitated the change, but it is true that Tartini’s early sonatas are full of double and triple stops, florid passage-work and elaborate ornamentation. The last piece in the 1732 set of sonatas, the multi-section Pastorale, even uses scordatura, with the G and D strings of the violin raised a tone. By the early eighteenth century such devices, which had been developed to a high point in Germany and Austria during the seventeenth century, were distinctly old-fashioned in Italy. Corelli’s Opus 5 of 1700, the model for most subsequent collections of Italian violin sonatas, is relatively modest in its technical requirements. Tartini followed Corelli in laying out his 1732 set of sonatas in two parts. The first six have fugues as their second movements and belong to the da chiesa tradition, while the rest are da camera works and have binary movements; they are cast as preludes, allemandes, courantes, gigues and so on, but are not labelled as such. Yet the collection also looks forwards as well as backwards. Both the da chiesa and the da camera sonatas have three movements rather than the four or five of Corelli, and they are disposed in the pattern slow-fast-fast, which reached the height of its popularity in the middle of the century. Tartini’s harmonic language, too, is much more modern than Corelli’s: the brilliant passage-work is often supported by simple, slow-moving cadential progressions, decorated and softened by appoggiaturas. Tartini’s habit of giving his sonatas enigmatic titles drawn from Metastasio’s Classical dramas also anticipates the Classical period, when composers wanted their instrumental music to have a dramatic, operatic quality. The title ‘Didone abbandonata’ for Sonata No 10 in G minor only became popular in the nineteenth century, but it is certainly appropriate to the mood of the work, pathetic and tempestuous by turns, and it may go back to the composer. One night I dreamt that I had made a bargain with the Devil for my soul. Everything went at my command—my novel servant anticipated every one of my wishes. Then the idea struck me to hand him my fiddle and to see what he could do with it. But how great was my astonishment when I heard him play with consummate skill a sonata of such exquisite beauty as surpassed the boldest flight of my imagination. I felt enraptured, transported, enchanted; my breath was taken away; and I awoke. Seizing my violin I tried to retain the sounds that I had heard. But it was in vain. The piece I then composed, the Devil’s Sonata, although the best I ever wrote, how far below the one I heard in my dream! Lalande added that Tartini composed the work in 1713, which is impossibly early given the style of the music. It probably dates from the late 1740s or later. The trill appears in the driving Allegro assai that repeatedly interrupts a gentle Andante—representing, presumably, the sleeping composer. The work is played here from Cartier’s text; it differs in countless ways from the nineteenth-century edition that is still in widespread use. Tartini’s Opus 5 appeared in Paris in the late 1740s in an elegant edition engraved by Le Huë and dedicated to Tartini’s pupil André-Noël Pagin. The implication is that the set had been acquired from the composer by way of Pagin, though it is not certain that all of the six sonatas are authentic works. The rest of the music on disc 2—and, for that matter, the bulk of Tartini’s later sonatas—remained in manuscript. Much of it comes from an autograph volume which Tartini used to collect his solo violin music from about 1745 until his death; it is now in the Biblioteca Antoniana at the Basilica in Padua. There are also many manuscript copies, including an important collection, now at Berkeley in California, that was assembled by members of Tartini’s Paduan circle. Opus 5 No 6 is probably the earliest of the sonatas on this disc, despite its publication date, for it is similar in style to the Opus 1 Sonatas of 1732 (on disc 1). It is cast in a three-movemement pattern, with an opening slow movement followed by a lengthy, elaborate Allegro; the last movement, cast in the rhythm of a minuet, is a set of variations (or ‘divisions’, for the continuo part remains unchanged throughout) of ever-increasing complexity. The Sonata ‘in the style of the priest who plays the Portuguese guitar’ (a colleague, perhaps, of Tartini at Padua) is also taken up largely with virtuosic passage-work, though it is cast in the slow-fast-slow-fast pattern. The ‘Portuguese guitar’ can presumably be heard in the wild harmonic shifts and clashes of the first and third movements, reminiscent of Iberian folk music. In the slow movement the alternation of improvisatory arpeggios and simple chords is probably meant to represent the characteristic method of playing the Baroque guitar, which interspersed fingered passages with rasgueado (strummed) chords. The Sonata in D major was probably composed a little later. The passage-work is still ‘extreme difficult’, but it is now mixed to a greater extent with melodic material. In the second movement, for instance, a fanfare-like idea alternates regularly with arpeggiated passage-work, and there is a prominent return to the opening theme and key halfway through the second section. To our ears such ‘recapitulations’ anticipate Classical ‘sonata form’, but the device was well established in the dance music of the Baroque period. Another ‘Classical’ feature of this Sonata is the simple, subsidiary nature of the bass part. The continuo parts of solo violin music tended to decline in importance as composers abandoned counterpoint and fast-moving Baroque harmonic patterns in favour of simple, slow-moving progressions founded largely on tonic and dominant chords. It became common to perform such sonatas with just a cello, or without any bass instrument at all. In a letter written in 1750 to the writer Francesco Algarotti in Berlin, Tartini pointed out that the bass line of some ‘short sonatas for solo violin’ he had sent to Berlin was only included ‘for appearance’s sake’, that he himself played them ‘without bassetto’, and that unaccompanied performance ‘was his real intention’. The Sonata in B flat, bBb1, is a case in point. It is an excellent example of Tartini’s later ‘graceful and expressive manner’, with a melodious opening Largo (in the composer’s favourite siciliana rhythm), and a remarkably simple succeeding Allegro. Throughout, the double and triple stops are used not to display the virtuosity of the player (which is taken for granted), but to sketch in enough harmonies to make the expressive violin line more or less self-sufficient. We are not far removed here from the solo violin studies of the late eighteenth century, or even from the more expressive caprices of Paganini. Guiseppe Tartini naquit à Pirano près de Trieste (maintenant Piran en Yougoslavie) le 8 avril 1692. Le peu que l’on connaisse de ses premières années vient d’une biographie écrite par son ami, le violoncelliste Antonio Vandini. Sa famille le destinait apparemment à la prêtrise, et il fut envoyé à l’université de Padoue en 1708 pour y étudier le droit. Au lieu de cela, il se maria et se tourna vers la musique, ce qui le fit entrer en conflit avec les autorités ecclésiastiques et l’obligea à se réfugier à Assise, ou il aurait étudié auprès du compositeur tchèque Bohuslav Czernohorský. Tartini eut une vie nomade jusqu’en 1721, employé comme violoniste dans les villes du nord de l’Italie, avant d’être nommé premier violoniste à la basilique de Saint-Antoine à Padoue. Les conditions de son emploi le laissaient libre de voyager, et il passa plusieurs années à Prague, où l’avait attiré le couronnement de Charles VI en 1723. De retour à Padoue il fonda sa célèbre académie de violon, qui attira des élèves de tous les pays d’Europe, et pour laquelle il écrivit plusieurs traités, dont un ouvrage sur l’ornementation que Leopold Mozart pilla pour sa méthode de violon. Plus tard, Tartini consacra la plus grande partie de son temps à l’étude de la théorie musicale et de l’acoustique, et il publia plusieurs ouvrages théoriques entre 1750 et 1770. Ils présentent un étrange amalgame de théories archaïques, de mathématiques erronnées et d’observations concrètes, et furent très critiqués à l’époque par les progressistes; de nature sensible et réservée, il trouva ces critiques blessantes, et la polémique assombrit ses dernières années. Il mourut à Padoue le 26 février 1770. Tartini fut un compositeur prolifique pour son instrument. Il existe plus de 130 concertos pour violon certifiés de lui, dont plus de 50 existent toujours écrits de sa main, et environ autant de sonates pour violon seul ainsi que près de 40 sonates pour trio. Un grand nombre de ses œuvres fut publié au nord des Alpes par Michel Charles Le Cene à Amsterdam, par John Walsh à Londres et par Charles-Nicolas Le Clerc à Paris. Les compositeurs italiens avaient tendance à se faire éditer à l’étranger car en Italie l’édition était en déclin—la plupart de la musique y circulait sous forme de manuscrits—et aussi parce que le marché de musique instrumentale était beaucoup plus développé dans les villes opulentes du nord de l’Europe. La musique de CD1 provient, à une exception près, de Sonate a violino e violoncello o cimbalo Opus 1 (Amsterdam, 1732), réimprimées sous le titre XII Solos for a Violin with a Thorough Bass for the Harpsicord or Violoncello (Londres, 1746). Les œuvres publiées de Tartini sont un champ de mines pour le bibliographe peu soigneux. Il n’y a pas moins de cinq recueils portant le numéro d’opus 1, et la fiabilité des éditions d’Europe du nord est incertaine, il est difficile de croire par exemple, que les XII Sonatas for two violins and bass (Londres, 1750) furent réellement «imprimées aux frais de l’auteur» comme le prétend la page de titre. La seule œuvre de Tartini universellement connue au dix-neuvième siècle, la sonate «les trilles du diable», ne fut pas publiée intégralement de son vivant, et parut en définitive dans L’art du violon de J B Cartier (Paris, 1798). Cartier déclara qu’elle était «très rare», et qu’il l’avait acquise par l’intermédiaire de Pierre Baillot, qui avait fait ses études à Rome auprès d’un élève de l’élève favori de Tartini, Pietro Nardini. Le style de Tartini, comme celui de la plupart des compositeurs en activité au milieu du dix-huitième siècle, changea d’une façon marquée au cours de sa carrière. D’après Charles Burney, qui arriva à Padoue juste après la mort du compositeur et rencontra plusieurs de ses amis et collègues, «d’extrêmement difficile, son style devint en 1744 gracieux et expressif». On ignore quel événement amena ce changement, mais il est vrai que les premières sonates de Tartini abondent en doubles et triples cordes, traits fleuris et ornementation fouillée. La dernière des sonates de 1732, la Pastorale, utilise même la scordatura, en rehaussant d’un ton les cordes sol et ré du violon. Ce genre de procédé, très utilisé en Allemagne et en Autriche au cours du dix-septième siècle, était indéniablement démodé en Italie au début du dix-huitième siècle; l’opus 5 de Corelli, publié en 1700, et modèle par la suite de la plupart des recueils italiens de sonates pour violon, a des exigences techniques relativement modestes. Comme Corelli, Tartini présenta sa série de sonates de 1732 en deux parties. Les six premières ont une fugue comme deuxième mouvement et suivent la tradition da chiesa, tandis que les autres sont des sonates da camera et ont des mouvements binaires; ils prennent la forme de préludes, d’allemandes, de courantes, de gigues etc, mais sans en porter le titre. Mais ce recueil est tourné aussi bien vers l’avenir que vers le passé. Les sonates tant da chiesa que da camera ont trois mouvements plutôt que quatre ou cinq comme chez Corelli, et ils suivent le plan lent-vif-vif qui atteignit l’apogée de sa popularité au milieu du siècle. Le langage harmonique de Tartini est en outre beaucoup plus moderne que celui de Corelli: les traits brillants sont souvent soutenus par des marches cadentielles simples et lentes, décorées et adoucies par des appoggiatures. L’habitude qu’avait Tartini de donner à ses sonates des titres énigmatiques tirés des drames classiques de Métastase annonce aussi la période classique, où les compositeurs allaient vouloir conférer à leur musique instrumentale un caractère dramatique, lyrique. Le titre «Didone abbandonata» de la Sonate no10 en sol mineur ne devint populaire qu’au dix-neuvième siècle, mais il est incontestablement approprié à son atmosphère tour à tour pathétique et agitée, et remonte peut-être au compositeur. Lalande ajoute que Tartini composa l’œuvre en 1713, ce qui est impossible étant donné le style de la musique; elle date probablement de la fin des années 1740 au plus tard. Le trille figure dans l’Allegro assai énergique qui interrompt à maintes reprises un tranquille Andante—représentant, on suppose, le compositeur endormi. On a utilisé pour cette exécution le texte de Cartier, qui présente d’innombrables différences avec l’édition du dix-neuvième siècle dont l’usage est encore très répandu. L’opus 5 de Tartini parut à Paris à la fin des années 1740 dans une élégante édition gravée par Le Huë et dédiée à l’élève de Tartini, André-Noël Pagin. Il semblerait que la série ait été acquise du compositeur par l’intermédiaire de Pagin bien qu’il ne soit pas du tout certain que les six sonates soient des œuvres authentiques. Le reste des morceaux de CD2 et d’ailleurs la majeure partie des sonates plus tardives de Tartini existent toujours sous forme manuscrite. Un grand nombre d’entre elles viennent d’un volume de sa main que Tartini a utilisé pour rassembler ses morceaux de musique pour violon seul de 1745 à sa mort; il se trouve maintenant à la Biblioteca Antoniana de la basilique de Padoue. Il existe aussi de nombreux exemplaires manuscrits dont un important recueil, maintenant à Berkeley en Californie, qui fut compilé par les membres du cercle Tartini de Padoue. L’opus 5 numéro 6 est probablement la première malgré sa date de parution, car elle est en effet d’un style semblable aux sonates opus 1 de 1732 (CD1). Elle est écrite en trois mouvements avec un long mouvement d’ouverture suivi d’un Allegro élaboré prolongé; le dernier mouvement écrit sur un rythme de menuet, est un groupe de variations (ou de diminutions, car la partie en continuo reste inchangée à travers tout le morceau) d’une complexité qui ne cesse d’augmenter. La sonate «dans le style du prêtre qui joue la guitare portugaise» (peut-être un collègue de Tartini à Padoue) se compose aussi essentiellement de traits pour virtuose bien qu’elle soit écrite selon un motif lent-rapide-lent-rapide. La guitare portugaise s’entend probablement dans les changements et chocs harmoniques violents des premier et troisième mouvements qui rappellent la musique ibérique populaire. Dans le mouvement lent l’alternation d’arpèges improvisateurs et d’accords simples était probablement destinée à représenter la manière la plus caractéristique de jouer la guitare baroque qui intercalait passages doigtés et accords rasgueado (grattés). La Sonate en ré majeur a probablement été composée un peu plus tard. Les traits sont toujours «extrêmement difficiles», mais ils sont maintenant plus mélangés à une écriture mélodique. Dans le deuxième mouvement, par exemple, une idée qui s’exprime en fanfare alterne régulièrement avec des traits en arpège avec un retour important au thème et à la tonalité de l’ouverture à mi-chemin de la deuxime section. À nos oreilles de telles récapitulations présagent la forme de sonate classique mais c’était-là une technique bien établie dans la musique de danse de la période baroque. La nature simple et secondaire de la basse est un autre élément classique de cette sonate. L’importance des parties en continuo de la musique pour violon seul eut tendance à décliner alors que les compositeurs abandonnaient le contrepoint et les motifs harmoniques baroques rapides en faveur de simples progressions lentes essentiellement fondées sur des accords toniques et dominants. On prit l’habitude d’exécuter ces sonates avec un violoncelle seulement ou même sans aucun instrument de basse. Dans une lettre écrite en 1750 à l’écrivain Francesco Algarotti à Berlin, Tartini soulignait que la ligne de basse de certaines «courtes sonates pour violon seul» qu’il avait envoyées à Berlin, n’était incluse que «pour l’apparence», et que lui-même les jouait «sans bassetto», et qu’une exécution non accompagnée «était son intention réelle». La Sonate en si bémol bBb1 en est une preuve. C’est un excellent exemple de la «manière gracieuse et expressive» tardive de Tartini, avec un Largo d’ouverture mélodieux (sur le rythme sicilien favori du compositeur) suivi d’un Allegro remarquablement simple. À travers tout le morceau les doubles et triples barrés ne servent pas à mettre en valeur la virtuosité du musicien (qui est présumée) mais à tracer suffisamment d’harmonies pour rendre la ligne expressive du violon plus ou moins indépendante. Nous ne sommes pas loin ici des études pour violon seul de la fin du dix-huitième siècle ni même des caprices plus expressifs de Paganini. Giuseppe Tartini wurde am 8. April 1692 in Pirano bei Triest (dem heutigen jugoslowischen Piran) geboren. Die wenigen Fakten, die über seine ersten Lebensjahre bekannt sind, entstammen einer Biographie, die von seinem Freund, dem Cellisten Antonio Vandini verfaßt wurde. Wie es scheint, hatte ihn seine Familie zum Geistlichen bestimmt, und 1708 reiste er zum Jurastudium nach Padua. Dann jedoch heiratete er und wandte sich der Musik zu, was ihn in Konflikt mit den kirchlichen Behörden brachte und ihn veranlaßte, in Assisi Zuflucht zu suchen, wo er bei dem tschechischen Komponisten Bohuslav Cvernohorský studiert haben soll. Tartini führte ein Nomadenleben als Violinist in mehreren norditalienischen Städten, bis er 1721 zum Leiter des Orchesters der Basilica di Sant’ Antonio in Padua ernannt wurde. Die Bedingungen seiner Ernennung ließen weitere Reisen zu, und er verbrachte mehrere Jahre in Prag, das ihn 1723 mit der Krönung Karls VI. anlockte. Bald nachdem er nach Padua zurückgekehrt war, gründete er seine berühmte Musikakademie, die Schüler aus ganz Europa anzog und ihn ermutigte, eine Reihe von Abhandlungen zu schreiben, darunter ein Werk über das Verzierungswesen, das später von Leopold Mozart für dessen Violinschule geplündert wurde. Tartinis weitere Laufbahn konzentrierte sich vor allem auf die Erforschung von Musiktheorie und Akustik, und er veröffentlichte in den 50er und 60er Jahren des 18. Jahrhunderts mehrere Theoriewerke. Diese sind eine seltsame Mischung aus archaischen Theorien, fehlerhaften Berechnungen und praktischen Beobachtungen und wurden seinerzeit von fortschrittlichen Autoren heftig kritisiert. Sein sensibles, bescheidenes Gemüt wurde damit nur schwer fertig, und seine letzten Lebensjahre waren von Kontroversen getrübt. Er starb am 26. Februar 1770 in Padua. Tartini war ein produktiver Komponist, sein Lebenswerk umfaßt mehr als 130 für echt erklärte Violinkonzerte, von denen über 50 im Originalmanuskript überlebt haben, und ungefähr die gleiche Anzahl Sonaten für Solovioline und etwa 40 Triosonaten. Viele wurden von Michel Charles Le Cene in Amsterdam, von John Walsh in London und Charles-Nicolas Le Clerc in Paris veröffentlicht. Die italienischen Komponisten zogen es im allgemeinen vor, ihre Werke im Ausland veröffentlichen zu lassen, da dieser Industriezweig in ihrem eigenen Land vom Untergang bedroht war—die meiste Musik wurde in Handschrift verbreitet. Ein weiterer Grund, sich an ausländische Verleger zu wenden, war, daß der Markt für Instrumentalmusik in den wohlhabenden Ländern Nordeuropas am weitesten entwickelt war. Die Musik dieser CD entstammt mit einer Ausnahme dem Band Sonate a violino e violonello o cimbalo, Opus 1 (Amsterdam, 1732), nachgedruckt als XII Solos for a Violin with a Thorough Bass for the Harpsicord or Violoncello (London, 1746). Tartinis Publikationen sind ein Minenfeld für den achtlosen Bibliographen. Es gibt nicht weniger als fünf Anthologien mit dem Etikett „Opus 1“, und es ist unklar, wie weit man sich auf die nordeuropäischen Ausgaben verlassen kann; zum Beispiel fällt es schwer, zu glauben, daß die XII Sonatas for two violins and bass (London, 1750) tatsächlich „auf Kosten des Urhebers“ gedruckt wurden, wie das Titelblatt behauptet. Das einzige Werk Tartinis, das im 19. Jahrhundert allgemein bekannt war, nämlich die „Teufelstrillersonate“, wurde zu Lebzeiten des Komponisten überhaupt nicht vollständig veröffentlicht und tauchte erst in J B Cartiers Abhandlung L’art du violon (Paris, 1798) wieder auf. Cartier sagte über sie aus, daß sie eine Rarität sei und daß er sie von Pierre Baillot erworben habe, der in Rom bei einem Schüler von Tartinis Lieblingsschüler Pietro Nardini studiert hatte. Wie bei den meisten Komponisten, die die mittleren Jahrzehnte des 18. Jahrhunderts durchlebten, machte auch Tartinis Stil im Verlauf seines Werdegangs erhebliche Veränderungen durch. Charles Burney, der kurz nach dem Tod des Komponisten nach Padua kam und eine Reihe seiner Freunde und Kollegen kennenlernte, schrieb: „Er veränderte seinen Stil 1744, von extrem schwierig zu anmutig und ausdrucksvoll.“ Es ist unklar, welches Ereignis die Veränderung ausgelöst hat, aber es trifft zu, daß sich in Tartinis frühen Sonaten unzählige Doppel- und Dreifachgriffe, viel blumiges Passaggio und kunstvolle Verzierungen finden. Die letzte der Sonaten von 1732, die vielsätzige Pastorale, zieht sogar Scordatura heran und verlangt, daß die g- und d'-Saite der Violine um einen Ganzton höher gestimmt werden. Dabei galten derartige Verfahren, die im 17. Jahrhundert in Deutschland und Österreich zur Hochform entwickelt worden waren, in Italien bereits Anfang des 18. Jahrhunderts eindeutig als veraltet. Schon Corellis Op. 5 aus dem Jahr 1700, das den meisten späteren Zusammenstellungen italienischer Violinsonaten als Vorbild diente, ist im Hinblick auf seine technischen Anforderungen relativ bescheiden. Tartini folgte Corellis Beispiel, indem er seine Sonatensammlung von 1732 in zwei Abschnitte gliederte. Die ersten sechs Werke haben Fugen als zweiten Satz und gehören der da chiesa-Tradition an, während die übrigen da camera-Werke sind und zweiteilige Sätze aufweisen; sie sind als Präludium, Allemande, Courante, Gigue und so weiter angelegt, jedoch nicht als solche gekennzeichnet. Die Sammlung ist jedoch nicht nur der Vergangenheit verhaftet, sondern auch zukunftsweisend. Sowohl die Kirchen- als auch die Kammersonaten haben drei Sätze statt vier oder fünf wie bei Corelli und folgen dem Schema langsam-schnell-schnell, das Mitte des Jahrhunderts auf dem Höhepunkt seiner Popularität angelangt war. Auch Tartinis Harmonik ist wesentlich moderner als die von Corelli; das brillante Passagenspiel wird häufig durch schlichte, langsam verlaufende Kadenzprogression gestützt, verziert und mittels Appoggiatura entschärft. Tartinis Angewohnheit, seinen Sonaten geheimnisvolle Titel zu geben, die er Metastasios klassischen Dramen entnahm, greift außerdem vor auf die klassische Ära, als die Komponisten anstrebten, ihrer Instrumentalmusik dramatische, opernhafte Züge zu verleihen. Der Titel „Didone abbandonata“ für die Sonate Nr. 10 in g-Moll setzte sich erst im 19. Jahrhundert durch, entspricht jedoch gewiß der abwechselnd kummervollen und aufbrausenden Grundstimmung des Werks und könnte vom Komponisten selbst stammen. Eines Nachts träumte mir, ich hätte mit dem Teufel einen Pakt um meine Seele geschlossen. Alles ging nach meinem Kommando—mein neuer Diener wußte im Voraus um jeden meiner Wünsche. Dann kam mir der Gedanke, ihm meine Fiedel zu überlassen und zu sehen, was er damit anzufangen wußte. Aber wie groß war mein Erstaunen, als ich ihn mit vollendetem Geschick eine Sonate von derart erlesener Schönheit spielen hörte, daß meine kühnsten Erwartungen übertroffen wurden. Ich war verzückt, hingerissen, bezaubert; mir stockte der Atem; und ich erwachte. Ich griff zu meiner Violine und versuchte die Klänge nachzuvollziehen, die ich gehört hatte. Doch vergebens. Das Stück, das ich alsdann komponierte, die Teufelssonate, mag das Beste sein, was ich je geschrieben habe, doch wie weit bleibt sie hinter jenem zurück, das ich im Traum gehört habe! Lalande fügt hinzu, daß Tartini das Werk 1713 komponiert habe, doch das wäre dem Stil der Musik nach unmöglich früh; wahrscheinlich ist es Ende der 1740er Jahre oder später entstanden. Der bewußte Triller taucht in dem drängenden Allegro assai auf, das wiederholt ein sanftes Andante unterbricht—vermutlich eine Darstellung des schlafenden Komponisten. Das Werk wird hier nach Cartiers Vorlage gespielt; diese weist unzählige Unterschiede zur Druckausgabe des 19. Jahrhunderts auf, die immer noch weithin im Umlauf ist. Tartinis Opus 5 erschien gegen Ende der vierziger Jahre des 18. Jahrhunderts in Paris als elegante Ausgabe, die von Le Huë graviert und Tartinis Schüler André-Noël Pagin gewidmet war. Das läßt vermuten, daß die Musik zwar durch Pagin vom Komponisten erworben worden war, was jedoch nicht gleichbedeutend damit ist, daß auch alle 6 Sonaten dieses Opus’ von Tartini selbst stammen. Die übrigen Werke Tartinis dieser CD—wie auch die meisten seiner späteren Sonaten—sind in Handschrift erhalten. Ein Großteil davon entstammt einem Originalmanuskript, in das Tartini alle seine Kompositionen für die Solovioline von circa 1745 bis zu seinem Tode niederschrieb; dieser Band befindet sich heutzutage in der Biblioteca Antoniana der Basilika in Padua. Es existieren in Berkeley, Kalifornien, außerdem noch viele weitere Manuskripte, darunter auch eine wichtige Kollektion, die von Mitgliedern aus Tartinis Paduaer Kreis gesammelt und zusammengetragen worden waren. Opus 5 Nr. 6 ist wahrscheinlich die früheste dieser Sonaten, trotz des späteren Veröffentlichungsdatums, denn sie gleicht stilmäßig den Sonaten des Opus 1 aus dem Jahre 1732 (siehe CD1). Sie verläuft nach einem dreisätzigen Schema, auf den ersten, langsamen Satz folgt ein langes, verwickeltes Allegro, und der letzte Satz, mit seinen menuettartigen Rhythmen, besteht aus einer Reihe von Variationen (oder „divisions“, das Continuo bleibt den ganzen Satz durch unverändert) von sich immer steigernder Komplexität. Die Sonate „im Stil eines Priesters, der die portugiesische Gitarre spielt“ (vielleicht ein Paduaer Kollege Tartinis) besteht ebenfalls zum größten Teil aus virtuosen Läufen, sie verfolgt jedoch ein Langsam-Schnell-Langsam-Schema. Die portugiesische Gitarre läßt sich vermutlich in den wilden harmonischen Lagenverschiebungen und Reibungen des ersten und letzten Satzes vernehmen, die so an iberische Volksmusik erinnern. Im langsamen Satz soll die Abwechslung improvisatorischer Arpeggios und einfacher Akkorde wohl die typische Methode des barocken Gitarrespiels darstellen, das mit gegriffenen Passagen mit rasgueado (geklimperten) Akkorden durchsetzt ist. Die Sonate D-Dur wurde wahrscheinlich nur wenig später fertiggestellt. Das Passagenwerk ist immer noch „extrem schwierig“, ist aber inzwischen weitgehend von Melodik getragen. So alterniert zum Beispiel im zweiten Satz ein fanfarenartiges Thema regelmäßig mit arpeggierten Läufen, und mitten im zweiten Satz erfolgt eine hervorstechende Wiederkehr zum Einleitungsthema und zur Einleitungstonart. Für unsere Ohren bedeuten solche Reprisen einen Vorgriff auf die klassische „Sonatenform“; von diesem „Kunstgriff“ wurde jedoch bereits ausgiebig in der Tanzmusik des Barocks Gebrauch gemacht. Ein weiteres „klassisches“ Merkmal dieser Sonate ist die schlichte, untergeordnete Rolle des Basses. Je mehr die Komponisten von Kontrapunkt und schnellen barocken Harmoniemustern Abstand nahmen und stattdessen den schlichten, sich langsam vorwärtsbewegenden Klängen, die auf Tonika und Dominantakkorden ruhten, den Vorzug gaben, desto mehr verlor das Continuo an Bedeutung. Solche Sonaten wurden im allgemeinen nur mit einem Cello vorgetragen oder überhaupt ohne ein Baßinstrument. In einem 1750 geschriebenen Brief an den Schriftsteller Francesco Algarotti in Berlin wies Tartini darauf hin, daß die Baßlinie in einigen „kurzen Sonaten für Solovioline“, die er nach Berlin geschickt hatte, nur „der Form halber“ mit aufgenommen wurde, daß er selber sie „ohne bassetto“ zu spielen pflegte und daß ein unbegleiteter Vortrag in „seiner wahren Absicht“ lag. Die Sonate in B, bBb1, ist ein ausgezeichnetes Beispiel von Tartinis späterer „anmutiger und ausdrucksvoller Art“. Sie eröffnet mit einem melodischen Largo (im vom Komponisten so geliebten sizilianischen Rhythmus), auf das ein bemerkenswert schlichtes Allegro folgt. Die hier angewandten Doppel- und Dreiergriffe dienen nicht dazu, die Virtuosität des Solisten herauszustellen (die er als selbstverständlich voraussetzte), sondern um genügend Harmonien hineinzuschreiben, damit die ausdrucksvolle Violinlinie für sich allein bestehen kann. Es ist von hier kein weiter Schritt zu den Studien für Solovioline des späten 18. Jahrhunderts oder zu den noch ausdrucksvolleren Capricen Paganinis.